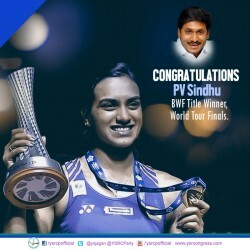 Leader of opposition in Andhra Pradesh Assembly and YSRCP chief YS Jagan Mohan Reddy congratulated star badminton player PV Sindhu for becoming the first Indian player to win the BWF World Tour Finals. In Sunday's final match, Sindhu trumped Japanese player Nozomi Okuhara to clinch the 2018 BWF World Tour Finals. "Congratulations to @Pvsindhu1 on your scintillating victory over #NozomiOkuhara, and becoming the first Indian to win the BWF World Tour Finals title! You make us proud! #PVSindhu #BWFWorldTourFinals2018," said his tweet.